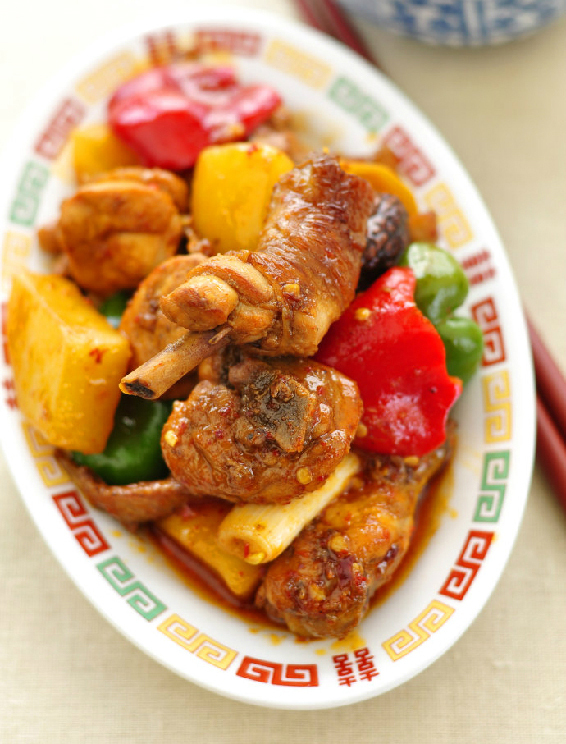 Da Pan Ji is braised chicken in a large flat plate and is one of the most distinctive, traditional dish in Xinjiang, China. It has a unique and novel taste. It has both the spicy taste of the Xinjiang region and the tenderness and fragrance of the Sichuan region that people who live there really appreciate and enjoy. Xinjiang Da Pan Ji has experienced a lot of development and change. It has spread all over the country, and there are many variations with different flavors. 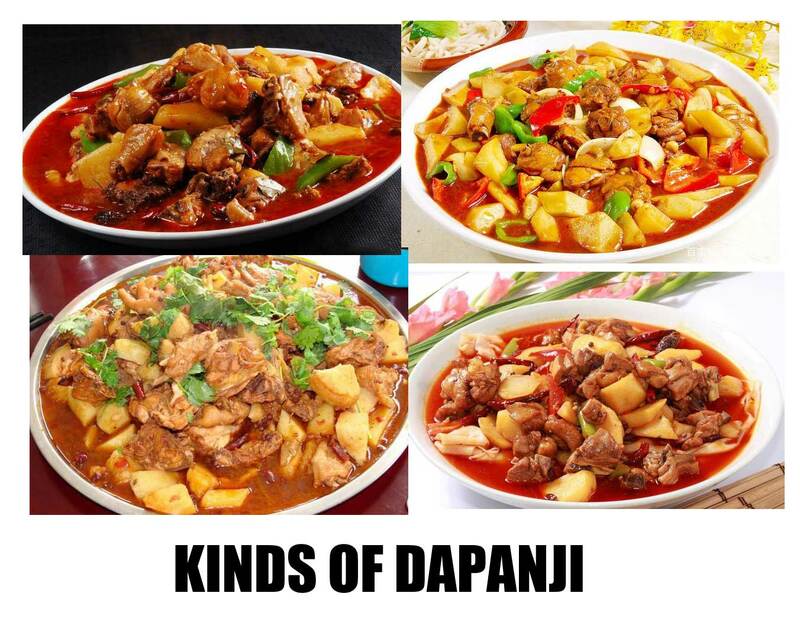 On September 10, 2018, “Da Pan Ji” was named as one of the top ten classic dishes in Xinjiang. 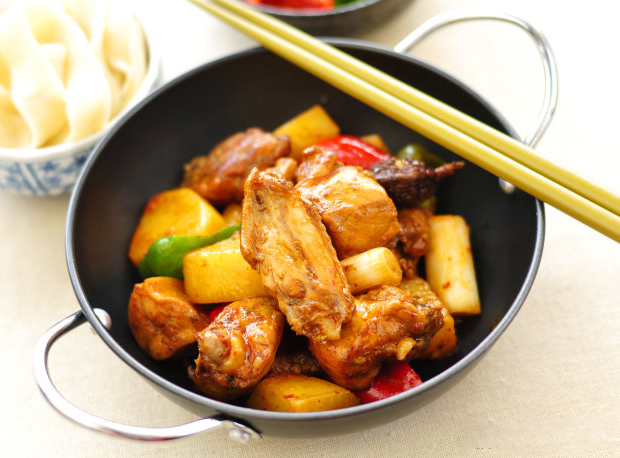 The delicious chicken is accompanied by savory soup, with wide noodles made by hand, soft potatoes and green peppers; this combination is really delicious, and will please everyone eating it! Step 1. Put the dried chili in warm water for 15 minutes and then drain. Take the whole chicken, separate and cut into pieces of about 3 cm, and rinse with water. Step 2. The green onion is cut into 4, 5 cm long sections, and the ginger is peeled and cut into large pieces, and the garlic is peeled and crushed. Step 3. Pour the cooking oil into the pan, add the white sugar after warming, turn heat to low. When the sugar starts to break down and boil, turn off the heat. Step 4. Add all the chicken pieces, turn the heat back on, toss the chicken in the sugar, turn off the heat, and set aside. Step 5. In another pan, add some oil, turn the heat to low after the oil is hot, stir fry the dried chili, add the onion, ginger and garlic. Step 6. Continue to add pepper, aniseed, Amomum tsao-ko, cinnamon, and bay leaves. Add the chicken and pour in enough warm water to cover the chicken. After it begins to boil, turn to medium heat and let stew. Step 7. When the remaining half of the soup is poured, add the chopped potatoes. If you like spicy food, add another spoonful of chili oil. Step 8. Add the peppers, turn the heat to low after 1 minute, and let the Da Pan Ji be stewed. Step 9. Add the salt and water to the medium-gluten flour, and knead into a smooth dough, rest for 20 minutes. Step 10. Apply a thin layer of oil to a cutting board. The dough is equally divided into 6 doses. Step 11. The dough is evenly rolled into strips of about 10 cm. Step 12. Gently stretch the strips 4 to 5 cm from both sides and then flatten them by hand. Step 13. Hold the ends of the flat strips with both hands and pull them evenly to the ends. Wide noodles will be done. Step 14. Pour enough water into a pot. After the water is boiling, slowly the noodles and cook for about 8 minutes. Step 15. After the noodles are cooked, strain and rinse with cold water. Step 16. You can pour it into the soup of Da Pan Ji, or you can add a little bit of oil to prevent it from sticking. Put it in a bowl, serve, and ENJOY!. 1. Tips for frying chicken with sugar and how to not agitate oil: My method is to turn off the heat after it has reached temperature, then gently add the chicken with one hand, and then quickly cover the lid with the hand. After the sizzling sound starts to lessen, heat it again to fry the chicken. 2. The key to good noodles is a smooth uniform shape. Therefore, when pulling the noodles, hold the ends of the flat strips with both hands and pull them evenly. The noodles made in this way are consistent from the thickness to the width, and the taste is better because they are cooked evenly.